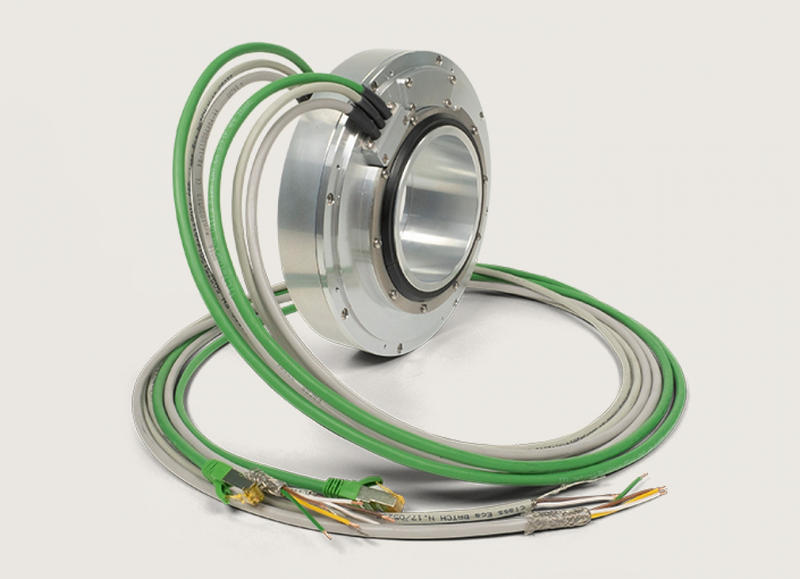 Unlike slip rings, contactless rotary joints from SPINNER also ensure reliable data transmission with large diameters and high data transmission rates. This can’t be achieved with slip rings, which are prone to micro-interruptions, especially with large clear internal diameters. This is where the new SPINNER data transmission unit comes in: It now permits dependable transmission at clear internal diameters up to 100mm. Plus, the contactless roating interfaces are non-wearing and maintenance-free. The benefits are substantial cost savings, outstanding reliability and a long service life. The contactless data channels, which are implemented with rotating capacitive couplers, have an even longer service life without requiring any maintenance. The supported real-time contactless Ethernet data types are proto- col-independent (using only OSI layer 1) and compatible with nearly all 100BASE-X-based industrial Fast Ethernet standards including 1000BASE-TX. The usable clear inside diameter is 100 mm.